Sometimes when you live on an island, you just feel like you need to get away somewhere. Any of my other local bloggers feel me? When you’re short on time and funds, the best way to make that happen is to pick a place in your town to stay and VOILA — staycation. When the amazing team at Turtle Bay Resort invited Dane and I to check our their beautiful property on the North Shore of Oahu, we jumped at the chance! Turtle Bay Resort in Hawaii is the perfect resort with the blend of sun, sand, pool and delicious food! 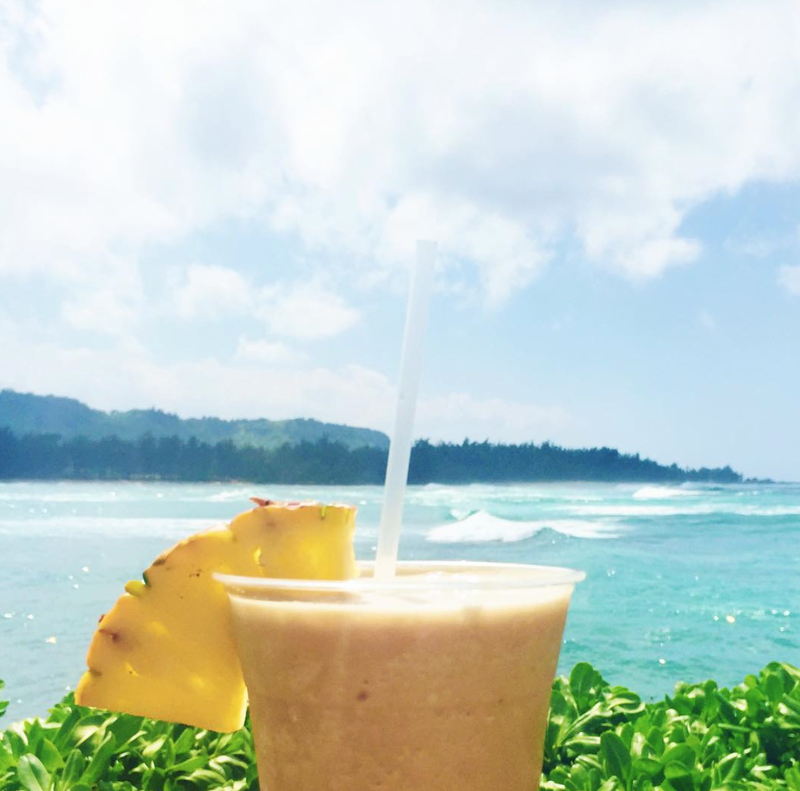 Stick around as I share our entire stay beginning to end at Turtle Bay Resort Hawaii! Dane and I have been itching to do a staycation at Turtle Bay Resort, located on O’ahu’s North Shore, for quite some time. They recently (within the past year or so) completely renovated the entire place. I think the best part about their resort is the prime location — there is nothing around for miles. It’s isolated, relaxing and in prime beach real estate. When we saw we had a long weekend coming up — we booked it! Their concierge service is amazing and as soon as you book, they help you out with making sure you have restaurant reservations and plan any activities you’re interested in. As foodies, we really wanted to check out the farm-to-table style Kula Grille, so we made reservations there for Saturday night and booked a kayaking adventure for first thing Saturday morning. It put me at ease to know that we those two things squared away before we even checked in. I couldn’t wait to get our staycation party started! As soon as we checked in on Friday, we headed straight for our room to check out the view. Needless to say, it did not disappoint. If you can do it, spring for the oceanview suite! Our room was well-equipped with modern features that gave an old Hawaii appeal. Plus, we got a Keurig stocked with Kona coffee, which was a definite bonus! I didn’t snap a photo of the bathroom, because that’s kind of weird, right? But I loved the open, spacious shower. No weird hotel shower curtains here! After settling in, we put on our swimsuits and went straight for the pool. Turtle Bay’s pool sits right on the ocean so you have all the best features of the beach without the grit and grime of sand blowing in your face on windy days (which is was!). We grabbed lunch and our first round of drinks. If you find yourself at The Point, I highly recommend The Monkey’s Lunch — a delectable combination of Kahlua, Bailey’s, a fresh banana and ice. I’m still dreaming about them! Dane and I weren’t quite sure what we were in the mood for in terms of dinner, so we went to every single restaurant in the hotel and checked out the menu. We finally decided on Pa’akai, the sea-to-table restaurant overlooking the ocean. IT. WAS. MAGICAL. I’m not keen on too much seafood, so I opted for the filet and let me just tell you — it melted like butter in my mouth. The restaurant was dark and this photo doesn’t do the meal justice, but the steak was paired with seasonal vegetables and the tastiest honey-mustard fingerling potatoes! After dinner, we had every intention of catching late-night happy hour from 9:30-11:30 in the lobby, but the sun and drinks had finally caught up to us. We called it a night and set our alarms early for a kayaking adventure! Turtle Bay offers guests so many different adventure activities — kayaking, SUP, surf lessons and segway tours, just to name a few — but we had our hearts set on kayaking. Shaka Kayaks did not disappoint. Our two-hour tour took us out in to the ocean and around one of the most gorgeous bay areas we had ever been to, which says a lot considering we’ve lived here more than 3 years! We were each in our own kayaks that had plexiglass windows, so we could see coral, fish and even some turtles during our adventure. Though sometimes rainy in the mornings on the North Shore, we could not have asked for better weather. By 10AM, we had already gotten a workout in, so we decided to head straight for the pool again. Turtle Bay was hosting an amateur surf competition so we snagged some seats on the outer rim of the pool to watch the surfers out in the ocean. These kids can really rip — I was so impressed! We ended up staying at the pool until 4! Something about a good book and sunshine kept us content all day to just sit back and enjoy ourselves. We headed back to our room, finished off our bottle of wine and enjoyed a few bites of cheese and crackers while we got ready for our reservation at Kula Grille. I was so excited for this meal that I had stalked the menu ahead of time and already knew I wanted to order the beet salad as an appetizer with the beef tenderloin main course. Kula Grille sources all of their meat and produce locally, so it sustains Hawaiian farms and farmers, which I love! The meal was everything I had hoped it would be…and more. When we got to the restaurant, we were greeted with delicious cornbread and honey to start. If you’ve never tried this combo — go do so immediately. Mmm…so good! The beet salad was really tasty — a great combination of fresh beets, crunchy seeds and tangy dressing. The beef tenderloin, like the filet from the night before, was cooked perfectly and practically melted in my house. To end our amazing meal, we chose pineapple and apple open-faced pie served with Macadamia Nut ice cream. I don’t think I’ve ever been so excited to dive into a dessert! It might not look like much, but the dessert was probably my favorite part of the meal. I’m a sucker for sweets! We didn’t want our staycation to be over, so we decided to take a moonlit walk on the beach (awww..so romantic!). Much to our surprise, a monk seal had also decided to saddle up on the sand for the evening, so it was cool to see him/her at a distance taking a snooze. Turtle Bay’s staff had roped the area off, which was also great to see. Hawaii’s wildlife is protected so touching, pestering or otherwise bothering our animal friends is illegal here. This definitely made my animal-loving heart happy! After our beach stroll, Dane and I called it a night. As I laid in bed, I thought about how amazing it was to hear the roar of the ocean as I drifted off to sleep. Can I get this treatment all the time?! All too soon, morning rolled around and it was time for us to pack up, check out and return to real life. Would I recommend staying at Turtle Bay Resort? Absolutely. I think what I love most isn’t the fabulous hospitality or the delicious drinks — it’s the authentic Hawaiian experience. So few resorts here can offer that and I think that’s what puts Turtle Bay above the rest. Thank you so much to the staff at Turtle Bay for making our staycation on for the memory books! If you are interested in your own Turtle Bay Resort vacation, I can’t think of a more romantic place to go!